Not only are these cedar fence boards easy to create in custom sizes but they are also inexpensive so you can afford as many as you like. Mine are now over 5 years old and still in fantastic condition. These really hold up to the elements! Do you love flower window boxes but hate the price? Me too, so I built myself some from inexpensive fence boards from the lumberyard. 1. Buy some cedar fence boards, I went with two 6 inch wide x 6 feet long and one 8 inch wide, and some scrap wood to make the ends. 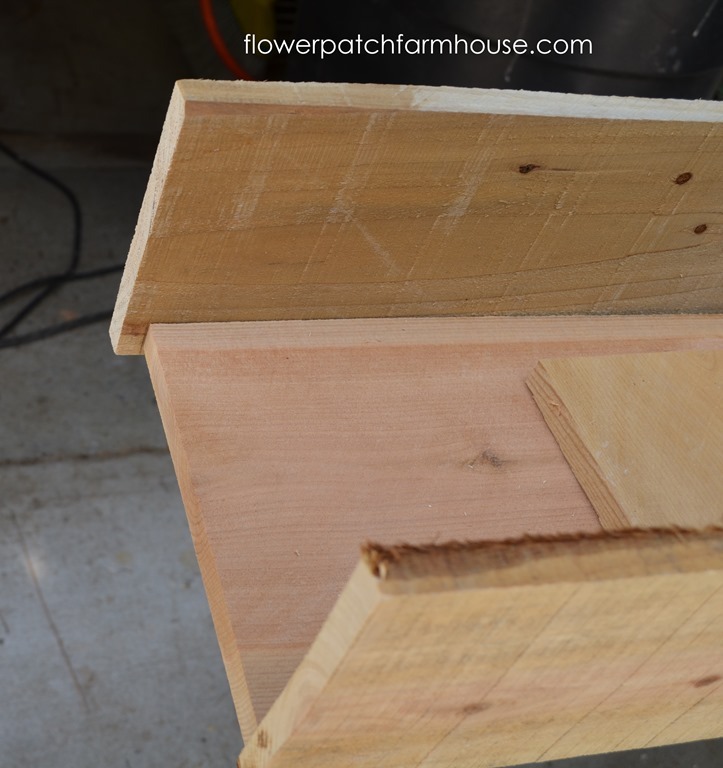 These are the inexpensive dog eared fence boards you can buy at most lumber yards and big box stores like Lowes and Home Depot, they are not cut to be exact dimensions and can vary widely. Usually they have both cedar and redwood, either will work. 2. 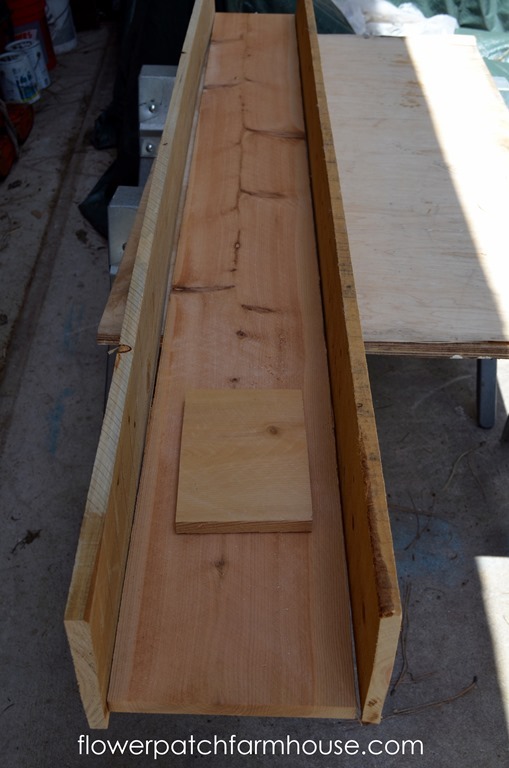 Square off the dog eared end and dry fit the boards. Since the fence boards are not cut the same you have to make them match with your trusty tape measure and saw. Or just line them up and then view and mark how much to cut off. 3. I put the end piece on first, used just scrap pieces of wood I had on hand. 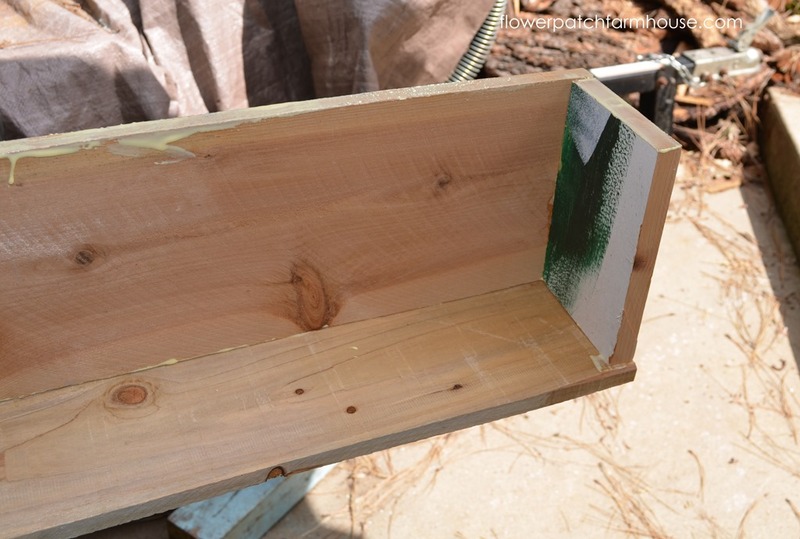 I applied wood glue before nailing. Actually this is a photo of me putting on the last side but it does show my end piece is just scrap and the generosity of Titebond glue. I started out with my nail gun but it jammed so I fell back on a good ol’ hammer and finish nails. A wee bit slower but still quite effective. 4. Screw to deck rail so the pesky raccoons will not knock your wonderfully roomy planter to the ground below. Here I am letting the glue dry before filling. Be sure to drill holds for proper drainage, I drilled mine towards the back of the planter where it hangs off the deck rail. 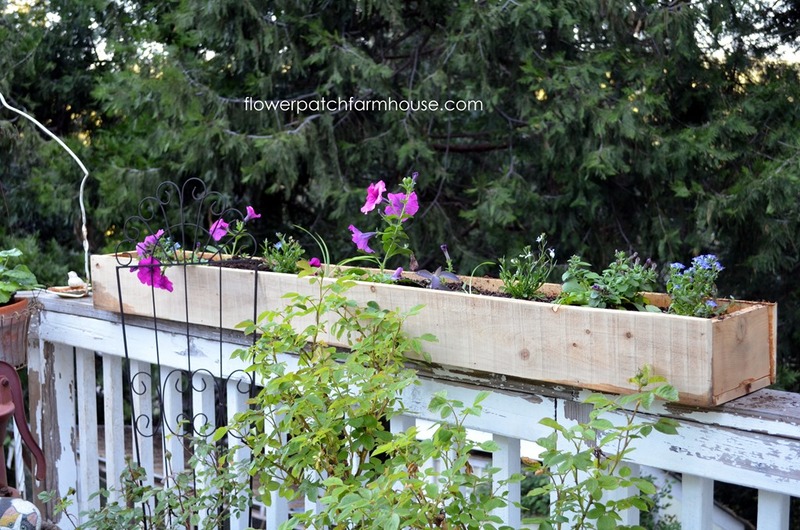 (moisture constantly on the deck rail will cause rot so if you want to protect your wood railing you can attach feet (little pieces of wood) to the bottom of the planter so it can get air flow. 5. I gave them 24 hours to dry then I had fun planting them up. I left them unpainted or stained, I want these to weather naturally to a soft grey. 6. 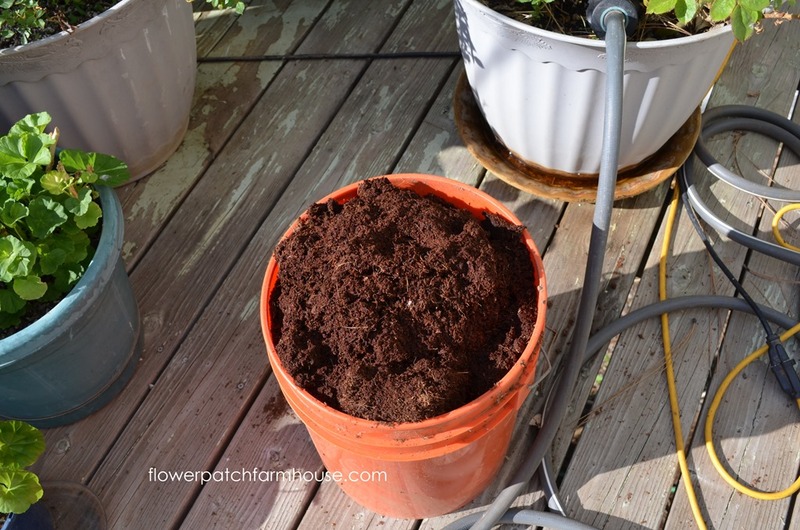 Mix up some coconut coir into your potting mix for added water retention. It is natural, sustainable and easy to work with. You can purchase Coconut Coir in bales or bricks, a little goes a LOOOONG way as it is compressed. First I must soak the coconut coir for a good few hours, make sure you have plenty of room in your bucket, this stuff really expands as it soaks up the water. I mix it maybe a quarter or third of coconut coir to 3/4 or 2/3 potting mix. 7. Fill your DIY planters with the potting/coconut coir mix and plant all your cascading flowers along with a bit of slow release fertilizer. Plant so your flowers have room to fill in. We have Purple Wave Petunias, Trailing Lobelia and a wee bit of white alyssum. Later in the summer this is how it looks. In the Fall I plant Violas in them, they last thru the winter snow and cold to put on their colorful show as soon as weather gets a wee bit warmer! 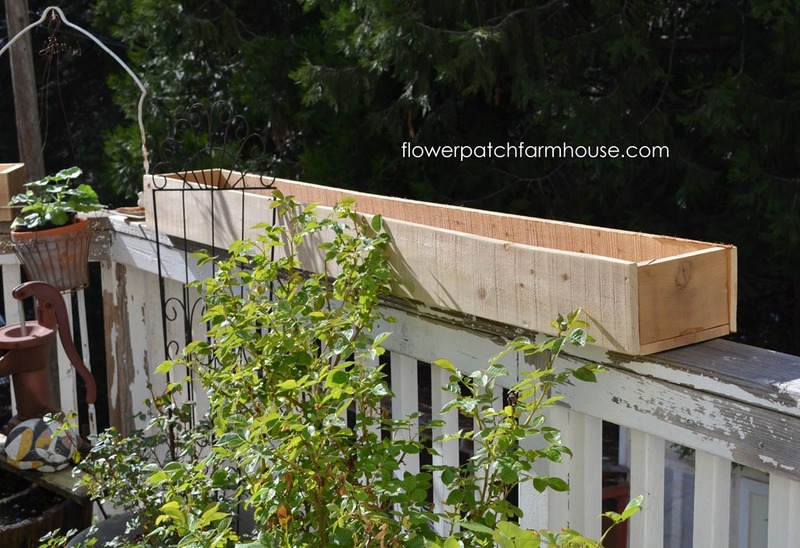 These were inexpensive and easy to make, I had the wood glue and finish nails on hand, for a total on the rest of the supplies it may have ran me about $8 per planter and they are a good size to fit plenty of flowers, 6 feet long by 7.5 inches wide. If you wanted you could also just slip in some 4 inch pots instead of putting the soil in the boxes. The height of the sides is just right to hide the pots and you could easily change out the flowers as you wish. So there you have it, quick and easy planters.